The IJ Mellis Cheesemonger on Victoria Street is THE place to buy cheese in Edinburgh’s Old Town. Opened in 1993 by Iain Mellis to fill Edinburgh’s gap of artisan cheesemongers its success has led to branches in Glasgow, St. Andrews, Aberdeen and other parts of Edinburgh. The monger on Victoria Street is truly a hole in the wall as it not much bigger than a small bedroom found in first year halls. Understated by its exterior when you enter the shop, your inner turophile comes out. The IJ Mellis Cheesemonger is an unexpected cheese vortex that could temp vegans and lactose intolerants alike. Inspired by a late afternoon dream I had about cheese, I woke up half an hour before closing to acquire some of the lactose goodness. Running to Victoria Street, I decided to pick up a few cheeses for desert at a dinner party. The result was a post-main cheeseboard including gouda, goats cheese, brie, sheep’s milk cheese and a stilton. 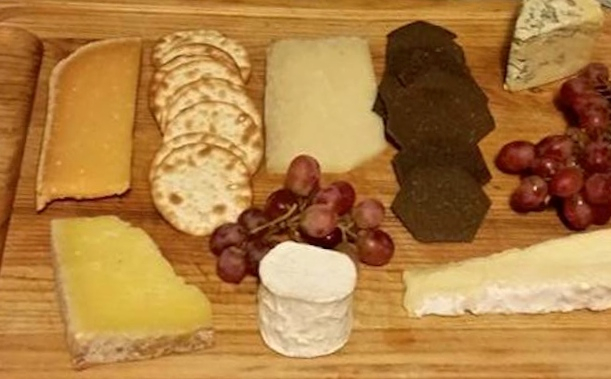 Each guest was asked to comment on the cheeses and select their favourite of the spread.The cheeses were tasted in the order listed above and after each cheese was tried they were ranked 1-5 amongst the group. Gouda was tasted first. The beautiful orange ‘Reypenaer V.S.O.P’ was made in Holland and aged 24 months. It was deemed nutty by all contenders and unique, creamy and said to have ‘a good crunch’. #SpoonTip: The Reypenaer comes from the Wijngaard family and was begun as a means of exchange with local Woerden farmers for groceries. The goats cheese was tasted second. The ‘Chabis’ goats milk soft cheese was French and had a soft white mould coating. It was the most diversely commented on of the five and was said it ‘takes time to articulate the taste’. It was thought of as mellow, fluffy, smooth with a sharp after taste. #SpoonTip: The exterior soft white mould is called “croûte fleurie” and it only needs twenty days to ‘ripen’. Brie was tasted third. 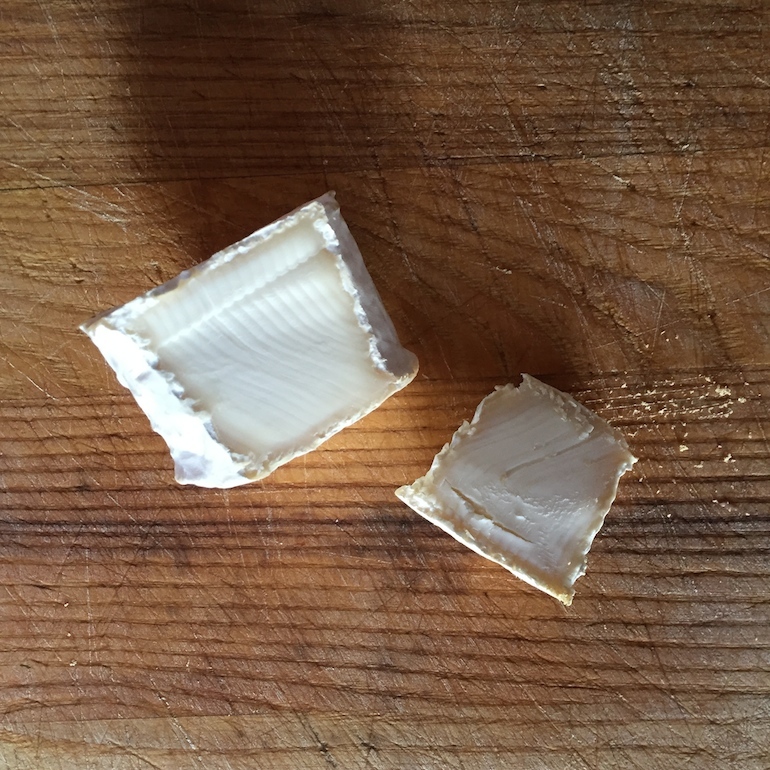 The silky ‘Brie de Meaux’ came from France and was deemed velvety and luxurious. It odour was compared to brussel sprouts and the final comment agreed by all contenders was ‘smells bad but tastes good’. #SpoonTip: The Brie de Meaux dates back to 1200 years crafted 30 miles east of Paris in the Ile-de-France region. The sheeps milk cheese was tasted fourth. The ‘Corra Linn’ sheeps milk cheese came from Scotland and it was the first time the majority of guests had sheeps milk. It was the least commented on and was called mysterious but dry and powdery. #SpoonTip: This cheese is a product of the Errington family run farm in Lanarkshire, Scotland with only 450 Lacaune dairy sheep. The last cheese tasted was the Stilton. The ‘Cashel Blue’ comes from south Ireland and was well liked among the guests who enjoyed blue cheeses. It was coined smoky and salty by all guests who choose to eat the cheese. #SpoonTip: Cashel Blue comes from a small farm of only 200 acres in south-east of Ireland from the Grubb Family. The favorite cheese coming in first was the Reypenaer followed by the Chabis, Cashel Blue, Brie de Meaux and Corra Linn. #SpoonTip: When serving a cheese board serve cheese with a mix of animal milks, grapes and a variety of crackers to ensure each guest has something they like. Are you loco for coco?